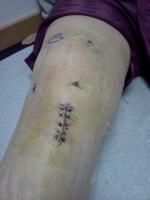 My 16 year old daughter had ACL reconstructive surgery in May 2007, using her hamstring. Her recovery has been good and she was back to playing sports after six months. In the past month she has noticed a sharp pain in her knee where the screw is, you can even see it protuding from her knee. I know that we can get the screw removed, but what is the recovery time frame and what are the possible draw backs for taking it out?